In the fight against aquatic invasive species (AIS), there is a new jargon being used to frame strategic prevention approaches. We are now speaking of ‘containment’ and ‘shields’ – referring to containing AIS within waters already infested with AIS and shielding un-infested waters to keep unwanted AIS out. With respect to Lake Minnetonka and zebra mussels for example, we hope and expect the state will keep them contained in Mille Lacs Lake, Prior Lake and the other waters they have infested, but it is a local responsibility to shield Lake Minnetonka. What this means for Lake Minnetonka is – if we want to protect our lake from zebra mussel, hydrilla, viral hemorrhagic septicemia, Brazilian elodea, spiny waterflea, rusty crayfish, Asian carp, and on and on – we had better adopt the shield approach. That is exactly what is being developed right now. The Lake Minnetonka Association is facilitating a multi-agency effort to develop an AIS prevention plan for Lake Minnetonka to include meaningful protection actions. Other agencies are partnering to develop the plan, including the Lake Minnetonka Conservation District, the MN Department of Natural Resources, Three Rivers Park District, Hennepin County Environmental Services and the Minnehaha Creek Watershed District. We expect the draft plan to be completed in December, then the respective organizations will review and be asked to adopt and implement the plan. It should be no surprise that a comprehensive protection plan will be challenging and expensive to fully implement. The technical committee developing the plan has adopted a goal of reducing the risk of an AIS introduction by at least 90%. We have identified 13 discrete pathways for AIS to get into the lake, but the main (over 50% of the overall risk) pathway is public boat ramps. We know already that voluntary cleaning actions and signage, while important, will not be nearly enough to reduce the risk of AIS introductions. While specific prevention actions have not been recommended at this time, it is clear that substantial investments will be required to meet the 90% reduction goal. As a community, we will need to decide soon – can we, should we, how do we make the investments that will be necessary to protect our lake? This year, prevention activities on Lake Minnetonka include inspectors at four public accesses during weekends and holidays and video monitoring at two accesses. That coverage has a budget is about $50 to $60 thousand dollars, yet represents a fraction (about 9%) of the 90% goal. 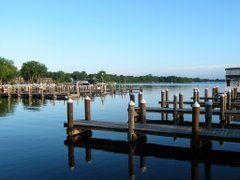 The Lake Minnetonka Association thinks that local leaders must contemplate and actualize real protection for the lake. We need serious new thinking and investment if we want to protect the lake that is the economic engine for our community. Furthermore, we think these investments will need to arise locally, as there are practically no state monies available. We hear, often actually, that fees assessed to boaters would be a logical and fair way to raise money for protection actions. We agree. However, the reality is that the political hurdles are enormous so this is not likely to happen any time soon. We have also heard that the constitutional amendment money is for clean water, so why not go there? Again, it has become clear that AIS protection activities are out of bounds for those monies. It will boil down to local investment and commitment – Are we there?